A police officer killed in the line of duty 10 years ago has been remembered by officers from his division. 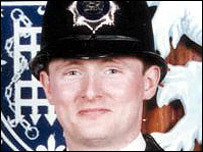 PC Philip Walters was fatally shot in the chest on 18 April 1995 as he tried to arrest a man after being called to a disturbance in Ilford, in east London. A floral tribute was placed at the memorial stone dedicated to him while flags were at half-mast at Ilford and Barkingside. Ray Lee was jailed for manslaughter at the Old Bailey in June 1996. PC Walters joined the Met in September 1993 at the age of 28 and was posted to Ilford in February 1994. Ch Supt John Boylin said: "It is extremely important that we remember that Philip was a colleague and friend and that his memory lives on. "We pay tribute to his courage and dedication. Police officers face potential risks and dangers every time they patrol and these risks are all too often taken for granted." The conference room at Ilford police station was named after PC Walters last year.